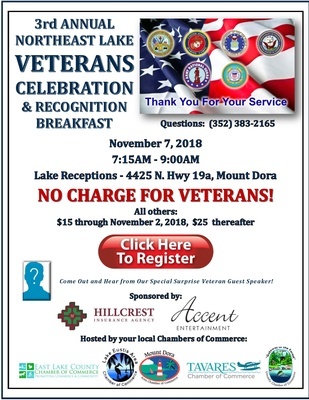 Join us for the 3rd Annual Northeast Lake Veterans Celebration and Recognition Breakfast on November 7th. No Charge for Veterans and all others pay $15 through November 2, 2018, $25 thereafter. Lake Receptions, 4425 N. Hwy 19A, Mount Dora, 32757. November 7th, 2018 from 7:15AM to 9:00AM. No Charge for Veterans, all others $15 through November 2nd, $25 thereafter.